I simply must ask: WHY? Why use bales as a roof insulation? The amount of time, effort, cost, and embodied energy in such a task seems to me to heavily outweigh the benefits. If two string bales yield an R-value of R-40 (debated by the way) across the 18″ direction, then one would only achieve an R-40 roof at best (perhaps a bit more with the inclusion of the other construction materials. A standard roof assembly provides R-38 so what on Earth is the point? If you want a super insulated roof, add a layer of rigid insulation on top of the roof assembly or add an extra framing member to deepen the joist cavity and add more insulation. There are environmentally sound insulations out there and ultimately, the roof will have less embodied energy and will be more environmental if done in a standard frame. Consider engineered lumber uses smaller trees, cotton insulation uses a renewable resource. Now compare that with ferro cement, poles big enough to handle the weight of the bales and the cement, 1×4 nailers, a heavy moisture barrier, chicken wire, and all his is experimental and may fail. To me this is another example of trying to place bales in a section of a building where they do not belong. My two cents. Want to learn more about straw bale houses and how to build one? Want to do so for FREE? 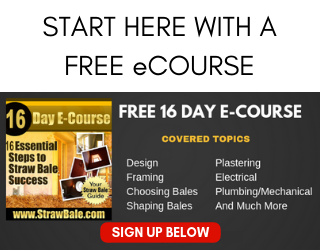 Sign up for our totally free 16 Day Straw Bale eCourse! Find out more HERE. Andrew has a passion for straw bale construction that is matched only by his desire to teach his knowledge to others. He has a wealth of experience in designing and building conventional, tiny, and straw bale homes. After years of building, he has moved his practice entirely to consulting and teaching. He shares his knowledge with thousands of people via his DVD series, this website and the roughly six hands-on workshops he teaches each year. Maybe your reaction is based on some non-ecological design you have seen (btw, I hope no pesticides have been used for the cotton – I would rather suggest Isofloc or equivalent cellulose or wood fibre insulation). In any case, bales are usefull also in the roof (and in my floor !). Thanks for your comments. I have seen bales used in living roofs and in other applications. In the case of a living roof, the design is going to call for the added structural elements to handle the weight of the load anyway, so I can see no problem with that. What I am commenting on is using bales simply as roof insulation in place of other insulation. There is no need for it. Again, R-40 versus R-38 does not justify the added materials and labor required to add the bales to the roof. I do not think that bales should not be considered if a living roof is in the design, but to simply replace insulation with bales above the walls is a waste of time and materials. Also, keep in mind that the more weight you have up high, the more risk you have in your walls. Engineers can explain it better than I can, but the idea is that the more weight you have up high, the more risk you have of your walls toppling over. It is always a good practice to minimize weight up high on any building, so adding bales to the ceiling not only requires more framing up high, but more framing and engineering in the walls. Again, it is a waste in my opinion. R40 is insufficient in a passive solar design. R60 is of significant benefit, even though it’s not 50% more than R40, it still allows thermal mass to retain heat for a longer, and is worth the extra money. But straw bales in the roof? I’m not sure that’s the best choice either. The potential gains in cost savings over rockwool, for example, are eliminated in the cost of the timber frame (unless you are going to support a living roof which has a long list of positive factors). I’ve even done some calculations using cordwood as roof insulation. It works, but, it’s more expensive. I think the best options are those that are actually designed for roof insulation. You have to balance the need for insulation with the need for it to be lightweight. The houses I build are typically finished with roughly R-57 vaults (only R-30 required by code) and even higher flat ceilings. The vaults are accomplished by using two layers of insulation between the rafters and a 3″ rigid foam above the rafters. The flat ceilings are much easier because of the extra space above the ceiling joists. I just don’t see the need to try a product that will not work as well and will create the need for extra framing materials and labor. I’ve used lots of blown-in cellulose (recycled newspaper)for attic insulation and like it a lot, but the price is going up. Has anyone blown-in chopped straw for attic spaces? I’m working towards lo-tech and low cost methods for use in our rural Montana Indian reservation where there is almost NO money for building materials. I like this idea, but am aware that some serious fire resistance material would have to be added. I am not sure Borax could suppress fire in a bunch of chopped, loose straw. I would be interested in seeing some testing though as the cost benefits would be high. bales of R40 with ceiling, airspace, anticon, then roof would rate somewhat above R40, and the standard R38 Andrew talks about. A bale is 360mm deep; the two layers of batts, and 3″ of rigid foam Andrew describes would be about 240mm deep, for R57. This implies that bales’ R factors would be considerably higher.. And at less than $10 psm they must surely be cost effective. Fire risk is minimal, and batts etc would melt, with various noxiouos results.. Just make sure the soffits are airtight!! 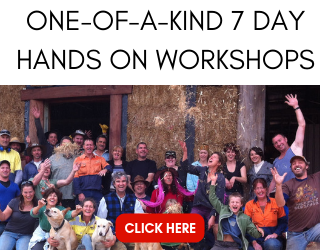 After building the first Class 1 residential strawbale building in Australia in 1996, we are now building again, and I am seriously considering this option: all responses welcome; email direct if you like. I will be interested to hear how this goes for you. Keep in mind, in terms of cost, that you will have to increase the size and perhaps spacing of your framing to accommodate the weight of the bales. This could be expensive. any body know what types and what quantities of chemicals are released into the atmosphere when foam is manufactured? perhaps the easiest route is more costly all said. foam is easy. industy has established a uniform product that’s certainly effective but is this what we really need for building vibrant healthy homes? the study of natural materials and variations of design which work with their attributes is essential. we need to do better. straw is good stuff. clay is a very capable natural preservative. vermiculite has good insulative qualities and isn’t bothered by water. anyhow, i’ve a question about finishing the eaves on a raftered timberframe that overhangs the bales by 16″. the roof is low pitched, 3:12, and is to be a living roof built up approx 12″. it has been suggested that i trim them off with a soffit that the top bale could snug up on. that done though, i’m at a loss to figure out how to insulate the eaves (the rafters will be exposed on the inside). rafters are 4×6″. i’m trying to build the place with “natural” materials. I am from Arkansas and here we have a lot of rice farms. That means that we also have a lot of rice hulls. From the research IÃ¢â‚¬â„¢ve done rice hulls meet the requirements for a fire resistant material .They are very tough and hold their shape well. They almost do not rot and have no nutritional value so they donÃ¢â‚¬â„¢t attract bus and rodents. They can also be blown in to the attic. Any ideas about this. I would love to hear more about the use of the rice hulls as blown in insulation. What R-Value do they have? The longevity of strawbale outlasts any synthetic insulations. That said it also better retains it’s insulating properties where as roxul or fiberglas will compress over time. While strawbale also does compress it does not do so to the extent of lighter weight materials. Nevertheless, the amount of energy required to make insulating foams, fiberglas, or extruded rock (roxul) is significantly greater than for strawbale. Simply, you have to redesign the roof, something which I’ve done. Kasia, I agree with you. One point nobody has brought up yet is that straw is cheap. I am a contractor, and just priced the amout of cellulose needed to R-48 an 1800 sq. ft. home. $4400 just for the material. You can get a lot of straw for half that amount. I am leaning towards using straw attic insulation as a substitute for blown-in cellulose. I am looking at covering the straw with a 1″ layer of clay for fire-proofing. Anybody out there got recent experience with this process? One thing to consider is how the straw performs when not compacted into a bale. I don;t think you will get a lot of insulation value from loose straw in the attic, especially if you plan to cover it with clay. It will compact, slightly, under the weight of the clay and will be hard to cover well enough for fire risk with only an inch of clay. If you go with heavier material: straw bales to actually get the high R-40+ value (loose straw will not give you that R-Value), you will need to upgrade your framing engineering and thus any savings you would have seen would be lost, especially when you add the labor involved in working with heavier timbers and bales up above your head which also need to be sealed for fire proofing. I am open to hearing success stories, but I don;t know that I can envision how that success would actually be achieved with this method. I am moving to Southern Brazil in 2010 and want to build some Straw Bale houses. I would like to avoid using Straw Bales for insulation in the attic, but I don’t feel like I have a choice. Common insulation materials we have in North America are virtually non existent in Brazil. Is anyone aware of insulation materials I can buy in Brazil? Or will I have to use Straw Bales in the attic? Hi David Chaves! I love your question! So far the consenus has been that using straw in the attic is too much trouble for too little effect, at least that is how I have interpreted the responses. However, your situation seems to be one of having no choice; it’s straw or nothing. Am I correct? The situation is similar on the Indian Reservation here in Montana because conventional insulation and building systems are simply too expensive for the desperately poor to afford. It’s gonna be straw or nothing… Lots of homes here have nothing, even with -40 winters and +120 summers! We’re that poor! So for people in our position the question isn’t IF we should use straw, it is how BEST to use straw. I still havn’t had a chance to try my clay-covered attic-fill idea (basically a horizontaly plastered wall kind of creation) but still think it would work way better than nothing and still has potential. So this leaves the question for the readers of this forum to answer for us of how best to use the straw. What kind of roof-attic system are you going to be using in Brazil? Rafters, purlins and metal roofing? More details on your design would probably help the readers come up with answers. Looking forward to more discussion! Thanks for your response Jim. My plan is to build a very inexpensive Straw Bale house between 500 and 100sq.ft. The temperature won’t go much colder than below freezing in the winter, but humidity makes it feel worse, although it’s not humid like the Amazon or anything. Their winter is really just a rainy season. Rafters and metal roofing is what I’ll most likely use. I plan to build the lowest safe slope possible to save on cost. I was hoping to have the bales between the rafters and avoid having an attic and unused space. Would it be a bad idea to cut the bale in half, so instead of a 14″ or 16″ tall bale, I make it 7″ or 8″. I don’t need a high insulated roof of R60 or even R40. Even R20 would be better than nothing. I’ll be using full bales in the walls though because it’ll be Load Bearing. I’m trying to minimize wasted space, time and money. I want to build these houses with the low income Brazilian in mind, which is most of them. I really don’t need the high insulation value of the bales for the area I’m going to live, although it doesn’t hurt either if it doesn’t cost much more money, time and energy. It’s just that it’s either straw bales or nothing. My issue with using spray foam or any other form of insulation that is not straw-bale is that I cannot grow it on site. The type of people to use straw bale construction generally are zero-impact, sustainable, self sufficients. These types of people (myself especially) are looking at ways to gathering all the necessary building materials from the same land on which they are building. For example an ecovillage that has a farm on which they grow all their own fiber for clothing, their own straw for housing, and so forth. With out massive industrialization (something we are trying to get away from) we cannot manufacture the kinds of insulation you are talking about Andrew. So, for us, it is worth the extra effort / work on the outset to ensure that the whole house is more locally sourced. Any ideas as to what other forms of insulation we can use that we can grow and process on site that will still achieve R-40? Also, while reading everyone’s posts and re-reading other info elsewhere I was reminded that if the straw bales are made of hemp stocks they are already fire resistant, as hemp is a fire resistant material. There is also the idea (for ease of replacing / placing the bales) you could frame the roof so that you slide the bales in at the highest point, they slide down what is essentially a chute to fit tightly in at the bottom of the roof, then you slide in the next bale and so on. This will aid in the compaction, gravity fed compaction in one direction so you only need to add additional insulation at the highest point. Then, when it comes time to replace the insulation, open the chute on the lowest point (preferably on the outside of the house as an overhang), and let them fall out, you can then send those bales to the compost to be turned into soil & methane. A nice, eternal cycle. Also, use hemp fiber board for your framing (not the load bearing frames, but the chute structure and as a dry-wall replacement unless you are using CO2 reclaiming drywall). This will increase your insulation value, your fire proofing, and your moisture resistance. And remember, no one (credible) ever said saving the planet would be easy, and really, that is why we are all here. So lets accept that it will take work, roll up our sleeves and dive in! Sorry to keep pestering, but here is yet another solution; it is a lightweight material, rigid, and has an R-value of 8/inch! Yes R-8 for one INCH of this stuff!! It can be made primarily of ag waste, thus reducing enviro impacts. What is it? Aerogel! Gotta love those eggheads at NASA!! Folks, below is an article about building a straw bale vaulted roof with NO ROOF FRAMING! An innovative new design in straw construction is turning the well-known Three Little Pigs fable on its head and could lead to entire family homes constructed of straw bales rather than timber or brick veneer. Dr John Zhang, a structural engineer from the UWS School of Construction, Property and Planning, has built a full-scale roof system made of straw bales at the University’s Blacktown Campus. In past constructions, only walls were made of straw. This meant that the significant thermal benefits from straw houses literally disappeared through the roof. Dr Zhang created his arched roof system by sandwiching straw bales between two layers of steel mesh that sit directly on top of the walls with no need for supporting rafters and beams. Builders will be able to use a conventional steel roof finish for weather protection. “I call it the ‘stressed sandwiched straw bale arch’. As far as I am aware, it is the world’s first straw bale arch roof using this system of construction,” he said. “This invention has the potential to increase sustainability in the building industry, it is low cost and very easy to construct. I hope my invention will lead to a further resurgence in straw-based construction practices. “Basically straw is a waste material which is grown around the world as a wheat and rice by-product. It is inexpensive and plentiful. It is one of the most environmentally sustainable ways to build a house – for example, you don’t need to chop down trees. Also, straw is regenerated once or twice a year compared with the typical regeneration period of 20 years for timber. Dr Zhang plans to carry out further loading tests to ensure his straw roof complies with the Australian standards. The straw bale roof, constructed by Dr Zhang and Blue Mountains straw bale builder Jason Dash, only took one day to erect. Zhang’s next project is to construct an entire habitable building in Dubbo in collaboration with John Dash and the landowner. CSIRO has just released a guide for the growing band of enthusiasts who are building homes using straw bale construction. The guide is the latest in a series of CSIRO Building Technology Files (BTFs), which provide solutions to a range of common problems faced in the building industry and by owner-builders. 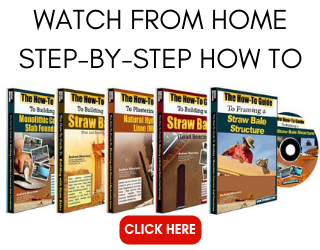 Dr Murray Hollis, the author of BTF 21 Straw Bale Construction, said the guide details the basics of straw bales, their manufacture and properties, and their preparation and use in building. Thermal properties, effect of moisture, footings and rendering are all discussed in the BTF. “The benefits for using straw bales for wall building include its environmental friendliness (straw is largely a waste product); its comfort (due to its thermal insulation quality); its appearance (somewhat rustic and perhaps Mediterranean appearance); its low cost; its suitability for DIY projects; and its flexibility in the detail of how this method may be applied,” he said. CSIRO BTF 21, Straw Bale Construction, is available through CSIRO Publishing at http://www.publish.csiro.au. Very cool that vaults are getting some attention! Vaults and roofs are somewhat different though, and I was speaking more to standard roof designs. That said, I’m excited to see the technology advance. The examples I’ve seen in the filed have had some problems so hopefully this test prototype has some new success. Here is an idea, don’t know if works. if I deep a straw bale in a large tank full of light clay, to soak then live the bale to dray.Can I after this treatment cut the bale in desired dimensions in my band sawn and use as roof or inner wall insulation? Although the soaking will coat the exterior of the bale, it will not penetrate very deep (assuming the bales are good, construction grade bales). That means that when you split the bale apart, you’ll be left with sections of uncoated straw. 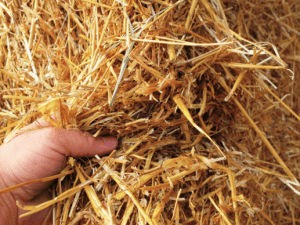 Furthermore, the R-value for straw is not terribly high per inch (roughly R-2.2) so unless you have a lot of straw in place, you won’t get the insulation value that you’re looking for. Great story, saved the blog in interest to see more! Don’t know alot about straw bail but I’m leaning tword it’s use in the eventual building of my home. I wish to use a load bearing system. I’ve envisioned a ceiling system id like to use. Its to build the side walls set a top plate. Then run heavy ceiling joist 2×8 or 2×6. Then above that fasten wire fence or mesh. Ontop of the mesh will go strawbale. The thought is that the bail and mesh will be ridged enough not to need end supports. That may not be so. The joist layout should be patterned to offer support. Other methods could be devised like tying the ends together. Finally the interior finish would be open beam with plaster between. Ends above the wall would be straw filled and plastered. The roof would be tied into the joists with some detail needed above the wall as the bail would need clearance for the roof. The facia board of the roof, interior walls, plaster, and wire would keep ceiling joist from racking. An eavless roof seems like it would be preferred. Some details would be needed. I haven’t fully gotten a grasp of the walls but they would need stakes or rods able to keep wall from blowing out under the weight. A lightweight bale would need to be selected for the ceiling insulation. I’m as yet unaware of the various bail weights. I’ve lifted a few and know they very greatly. So anyway seems like a strait forward idea. I can’t imagine I’m the first to have thought of it. I’d be interested in comments or thoughts on the idea. Hi jeremiah. I would be very careful using bales in the ceiling. A standard ceiling i a conventional house (depending on the location and open span) uses 2×12 framing at 24″ centers. If you add a lot of bales as insulation, no matter how light they feel, you are adding a LOT of weight. I would expect no less than 45 pounds per bale for a bale that will give you adequate insulation values. I think you’ll need something more like a 4×10 beam at 24″ centers or MORE. Also, you want eaves. No roof overhang means that your walls are unprotected from rain which is a bad idea. Keep reading through my blog and check out the free E course. You’ll learn a lot about the basics and have a better understanding of what it takes to build a solid and high quality SB house. You are on the right path, just keep learning the details before you build. We have now done our second bale roof, as part of an extension to the house we built three years ago. Wall stuccoing is going on as I type! I would recommend bales as roof insulation. THey keep the house warm and quiet, and are easy to use. We designed an experiment and have a structural enginer sign off on it, to test our unconventional ceiling material, and it’s ability to support itself and the weight of the bales. We fasten this to the bottom of rafters, spaced for three bales wide. In three days we put the bales in, put the battens in, and covered to lot with anticon and colorbond, for 200sm of (plan) roof area.) Easy-peasy.